The client on our local network (18.0.0.18) sends a DNS request to get the address of www.twicenat.mit.edu. The (Twice-NAT compatible) NAT router serving our local network intercepts this DNS request. It then consults its tables to find a special mapping for this outside device. Let's say, it is programmed to translate www.twicenat.mit.edu into the address 172.16.44.55. This is a private non-routable RFC 1918 address. The NAT router returns this value, 172.16.44.55 to the source client, which uses it for the destination. Once our client has the translated address, it initiates a transaction just as before. NAT now will perform both translation of the inside devices and the outside devices as well. The outside device address must be translated because the inside device is using 172.16.44.55, which isn't a valid address for the server it is trying to reach. The inside device address must still be translated as in regular NAT because 18.0.0.18 is not a valid public address for us. It may refer to a real machine in MIT and we aren't supposed to be using it on the Internet! Let's say that we are still using the pool of 20 inside global addresses from 194.54.21.1 through 194.54.21.20 for inside addresses, and let's further suppose the NAT router chooses 194.54.21.12 for this particular exchange. The transaction sequence would be roughly as described in Table 77, and illustrated in Figure 115. Inside Client Generates Request And Sends To NAT Router: Device 18.0.0.18 generates a request using the destination 172.16.44.55 that it got from the (NAT-intercepted) DNS query for www.twicenat.mit.edu. The datagram is sent to the NAT router for the local network. 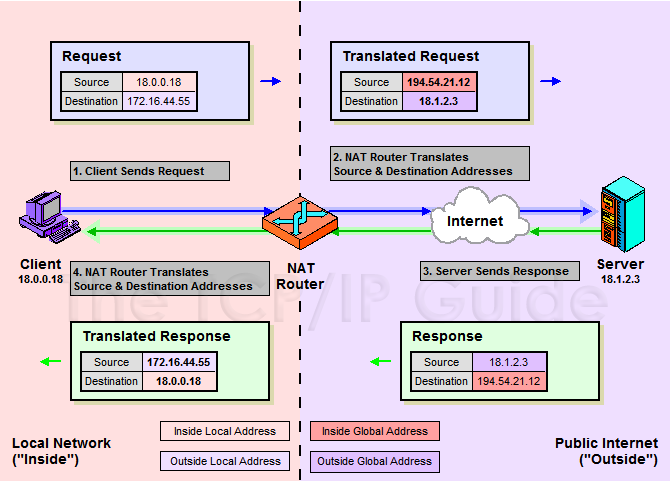 NAT Router Translates Source Address And Destination Address and Sends To Outside Server: The NAT router makes two translations. First, it substitutes the 18.0.0.18 address with a publicly registered address, which is 194.54.21.12 for this example. It then translates the bogus 172.16.44.55 back to the real MIT address for www.twicenat.mit.edu. It routes the datagram to the outside server. Outside Server Generates Response And Sends Back To NAT Router: The MIT server at 18.1.2.3 generates a response and sends it back to 194.54.21.12, which causes it to arrive back at the NAT router. NAT Router Translates Source Address And Destination Address And Delivers Datagram To Inside Client: The NAT router translates back the destination address to the actual address being used for our inside client, as in regular NAT. It also substitutes back in the 172.16.44.55 value it is using as a substitute for the real address of www.twicenat.mit.edu. This figure is very similar to Figure 112, except that the as you can see, both source and destination addresses are translated by the NAT router each time (shown in bold). Table 77 contains a complete explanation of the four steps in overlapping NAT. Refer to Figure 111 for an explanation of address types. As you can see, in this example the outside local and outside global addresses are different, unlike in the preceding NAT examples. Twice NAT can also handle an inbound transaction, by watching for datagrams coming in from the Internet that overlap with the addresses used on the local network and doing double substitutions as required. Key Concept: Overlapping NAT is used in situations where both the source and destination addresses in a datagram are private addresses or otherwise cannot be used regularly on the public Internet. In this case, unlike the other types of NAT, the NAT router translates both the source and destination addresses of incoming and outgoing datagrams. On outgoing messages, inside local addresses are changed to inside global and outside local to outside global; on incoming messages, inside global addresses are changed to inside local and outside global to outside local.